A couple of years ago, I was strolling through an herb garden and pushed aside a tall clump of leafy green stems overhanging the path. I regretted this move within seconds as the back of my hand and wrist began tingling, then stinging, then burning as if I’d been stung by a score of little bees. After a few moments of utter confusion mixed with growing distress, I realized what I’d gotten into: stinging nettles! Stinging nettle (Urtica dioica) grows abundantly throughout North America and temperate regions across the Northern Hemisphere. The stems and foliage are covered with brittle, needlelike hairs, called trichomes, no doubt an adaptation to deter herbivory. Each trichome contains at its base a potent mix of irritating compounds, including histamine, acetylcholine, serotonin, and formic acid. The tips of the trichomes break off upon contact, releasing the chemicals. Pity the poor creature that bites off a mouthful of these leaves—or touches them with her bare hands. In addition to its defense mechanisms, the weedy success of stinging nettle can also be attributed to the facts that it is a perennial; it spreads by rhizome as well as by seed; and given moist, reasonably rich soil, it can thrive in the light shade of woodland brooks or in sunny meadows, along roadside ditches, and in disturbed areas like barnyards. The species is also sometimes cultivated intentionally, as it was when I came across it in the herb garden. Why grow such a noxious plant? Stinging nettles are both tasty and healthful and considered a desirable, if weedy, herb. The leaves, stems, and roots have been used for food, medicine, cordage, and dye for millennia. 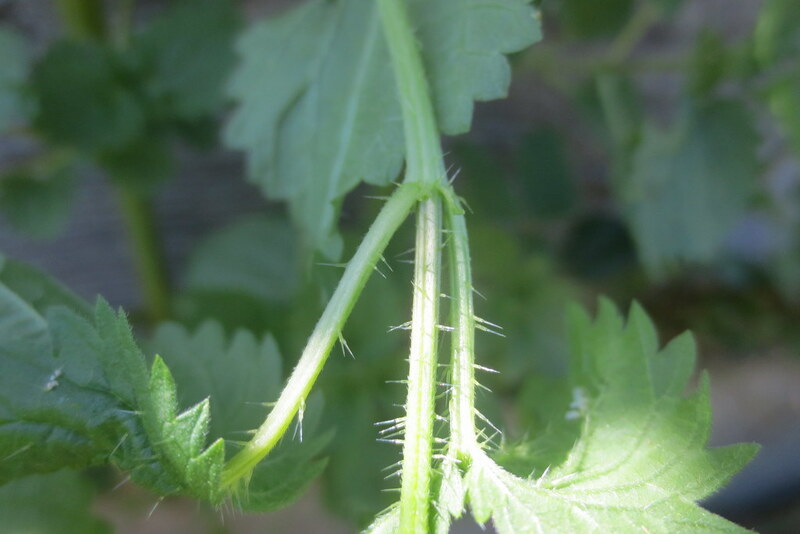 To recognize stinging nettle—a useful skill to avoid accidental agony—look for the plant’s long, hairy, slightly heart-shaped serrated leaves, which grow opposite each other on tall, fibrous, hairy stems that can reach up to six feet tall. Because it spreads by rhizomes, stinging nettle is often found growing in patches. In late summer, dense panicles of tiny greenish-yellow flowers bloom at the leaf axils before forming seeds that drop to the soil in the fall. Not long after my first encounter, I had another brush with stinging nettle. 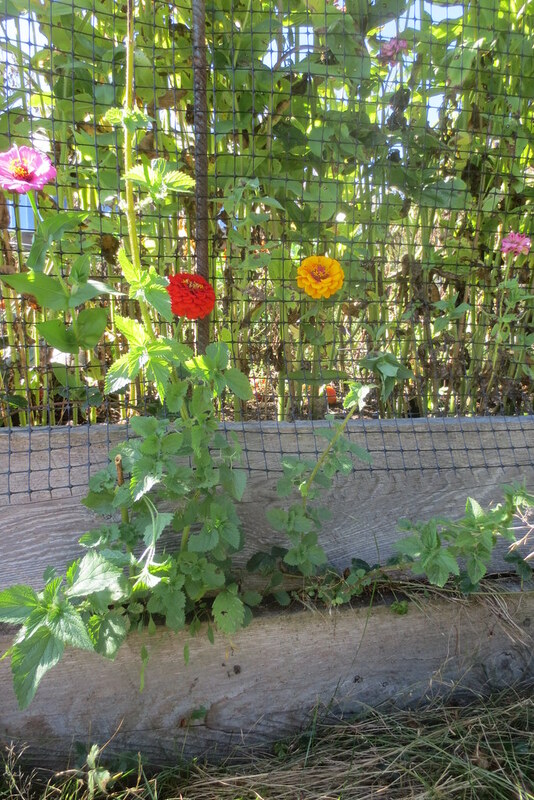 This time, a single plant was growing at the bottom of my raised-bed vegetable garden, camouflaged among some zinnias. I immediately ran inside and scrubbed down with soap and water, but no relief. Instead of 20 minutes of discomfort like my first run-in with it, this time I endured distractingly painful hives up and down my forearm that felt like multiple fresh wasp stings for more than 24 hours. A Google search revealed a number of folk remedies, including applying a poultice made with other weeds usually found nearby, such as jewelweed (Impatiens capensis) and dock (Rumex species), as well as household first aid like hydrocortisone cream, calamine lotion, and baking soda. Nothing helped me but time. When I was ready to venture back to the garden, I wore leather gauntlet gloves to cut down the plant’s stems and lay them on the hot cement of the driveway to dry out (and lose their stinging properties) before composting. To make sure it didn’t come back, I dug down into the loose soil with my fingers and winkled out every bit of yellow rhizome I could find. And until I’m sure no nettle seeds are left to germinate, I’ll be sure to wear gloves to weed my garden! 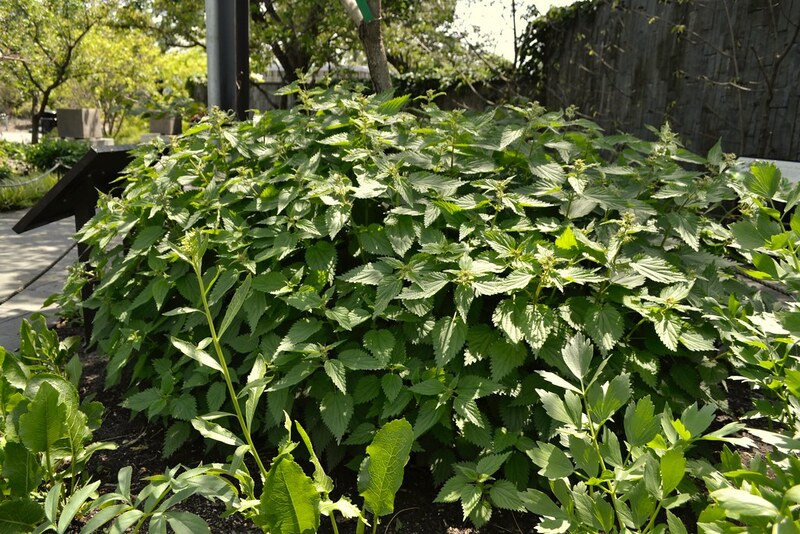 The Weed of the Month series explores the ecology and history of the common wild plants that most gardeners consider weeds. Joni Blackburn is the copy editor at BBG. I also have a clump of stinging nettles growing in my backyard. Instead of composting them like before, nowadays I gather a plastic bag full of cuttings, rinse them, chop somewhat, put in a pot, and pour some boiling water over them. After a couple of hours, the dark fluid gets strained and stored in the fridge for sipping during the week. Great stuff, can be mixed into iced tea! My experience is that the stinging nettles cultivated to eat are much less toxic than wild ones! Growing up in a rural area, I quickly learned to avoid stinging nettle. Some 20 years later, I bought a house with a plot of it. I learned I could pull it out bare-handed when it strayed. Thinking my earlier experience was related to my child skin, I touched a plant when visiting at my mom’s. NO! It really hurt, like the author said. So I think the plants in my backyard, grown for eating, are a different species than the wild ones. To relieve or prevent the irritation, try immediately running ice cold water over the area. This works quite well for me. Though it looks innocuous, Urtica dioica (stinging nettle) is covered in needlelike hairs that contain irritating compounds. Photo by Joni Blackburn. Urtica dioica (stinging nettle) in the Herb Garden. Though it grows abundantly as a weed, stinging nettle is also sometimes cultivated as a food plant. Photo by Blanca Begert. 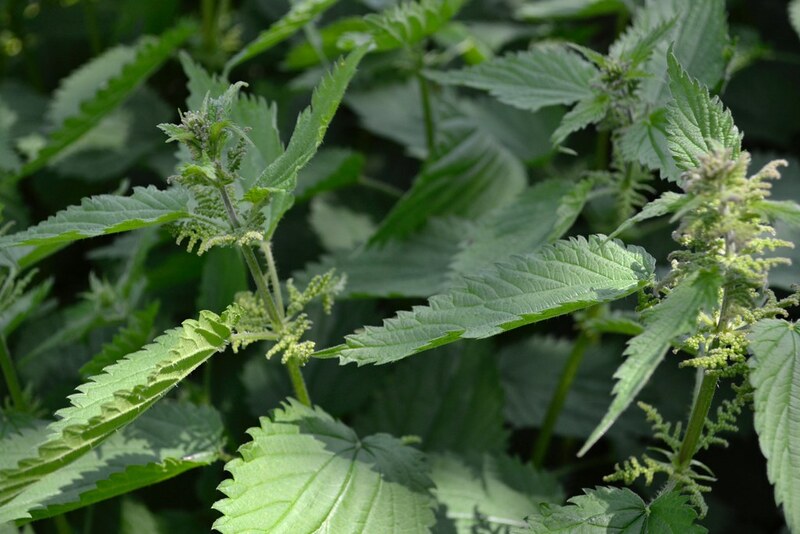 Though visible, the noxious hairs on the stems and leaves of stinging nettle (Urtica dioica) are easy to overlook. Photo by Joni Blackburn. 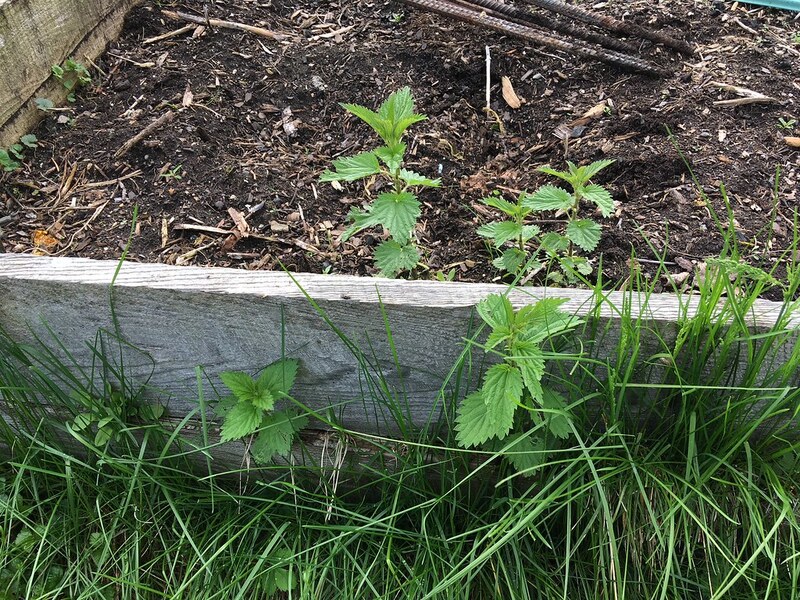 Urtica dioica (stinging nettle) growing among zinnias in a raised garden bed. Photo by Joni Blackburn. Urtica dioica (stinging nettle) in flower. Photo by Blanca Begert.